THE MESSAGE was hard to miss. “Welcome to Hanoi, city of peace” read the multi-coloured, flashing LED display on the road from the airport into central Hanoi. Placards depicting stylised doves and hands clasped in a deal-sealing shake lined the streets all over town. Even the South Korean pastry chain catering to the press got in on the act and put up posters calling for peace on the Korean peninsula in anticipation of the second meeting between Donald Trump, America’s president, and Kim Jong Un, North Korea’s dictator, in Vietnam’s capital this week. The decorations turned out to be overly optimistic. On February 28th American officials abruptly cut the summit short, cancelling a “working lunch” and a joint signing ceremony that had been planned for later in the day. Instead they announced that the two leaders would be leaving Hanoi without agreeing on a deal. In a press conference shortly afterwards, Mr Trump said that he and Mr Kim had had a “very productive time” but had ultimately failed to come to an agreement that would work for the United States. “Sometimes you have to walk,” the president told reporters. That was a surprise. Many observers had predicted a narrow deal, in which North Korea might have offered the dismantlement and inspection of its main nuclear site at Yongbyon in return for goodwill gestures by America, such as the establishment of liaison offices in both countries and moves towards a declaration ending the Korean war. The talks’ failure will dismay Moon Jae-in, South Korea’s president, who had been planning to announce his new vision for economic cooperation on the Korean peninsula at celebrations marking the centenary of the March 1st movement, a rebellion against Japanese colonialism that is celebrated by both Koreas. However, given the large gap between the two sides’ negotiating positions and the lack of agreement in working-level discussions in the run-up to the summit, it had always been optimistic to assume that Mr Trump and Mr Kim would thrash out in a few hours what their negotiators had failed to agree in weeks of talks. 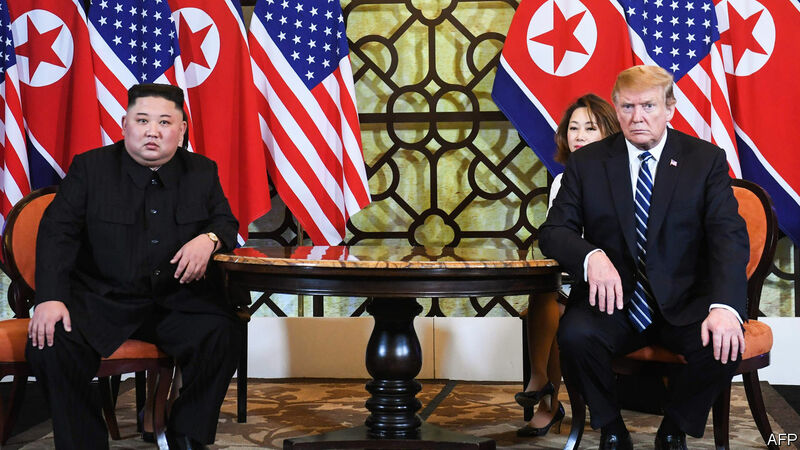 At their first meeting in Singapore last June, the two leaders had pledged to establish “new US–DPRK relations” and to build a “lasting and stable peace regime on the Korean Peninsula”. Mr Kim also pledged to work towards “complete denuclearisation of the Korean Peninsula”. In the months since, the fuzziness of that statement had led to a deadlock, since the two sides were unable to agree on what any of those commitments actually meant and in what order they should take place. North Korea was adamant that a reset of relations, including security guarantees and, ideally, relief from sanctions, had to precede any moves towards disarmament. America insisted that no concessions would be forthcoming without substantial steps towards disarmament, such as the closure of some of the North’s main nuclear sites, verified by international inspectors, or a list of all nuclear facilities and a timeline for their dismantlement. In recent weeks American officials had sounded ever less exacting both in their demands and in the timeframe for achieving them, appearing to accept denuclearisation as a long-term goal that would be reached step by step, if at all. “I’m in no rush,” Mr Trump repeatedly said before he travelled to Vietnam, a stance he reiterated even as he entered talks with Mr Kim on the morning of February 28th. Yet even this growing malleability, it seems, was not enough to mollify the North Koreans. Nonetheless, there was an air of bonhomie. Just as in Singapore, the two leaders exchanged smiles and handshakes in front of an enormous display of American and North Korean flags and congratulated each other on their “successful and great meeting” before most of it had taken place. On Wednesday evening, they could be seen bantering over a dinner of shrimp cocktail, steak, pear-fermented kimchi and hot chocolate cake. In an effort to whet North Korea’s appetite for market reforms, a group of officials was taken around a Vietnamese car factory and given a talk on joint ventures while their boss prepared for his meeting. Mr Trump, meanwhile, tweeted about the “AWESOME” opportunity for “my friend Kim Jong Un” to turn North Korea into an economic powerhouse. In the end, no amount of banter or allusion to future riches could bridge the gap. “It was about the sanctions,” Mr Trump confirmed when asked by reporters. “They wanted them lifted entirely but we couldn’t do that.” North Korea was offering too little—in essence, apparently, some form of access to Yongbyon. Both Mr Trump and Mike Pompeo, America’s secretary of state, emphasised that “real progress” had been made at the summit. They said that the relationship with North Korea continued to be productive, that Mr Kim had promised to stick to his moratorium on tests of nuclear devices and missiles and that they were hoping to make headway on an agreement in the weeks and months ahead. Mr Trump and his aides seem to have concluded that walking away will do less harm to America’s security than showering North Korea with concessions without gaining much in return. They are also implicitly admitting that denuclearisation is a long process rather than something that can be achieved overnight, as Mr Trump had previously implied. The calm mood that has prevailed on the Korean peninsula for the past year is clearly preferable to the nuclear brinkmanship of 2017. However, according to security analysts and intelligence services, even though Mr Kim is no longer conducting tests, he is still expanding his nuclear programme. Mr Trump’s insistence that there is “no rush” to disarm North Korea suggests a preference for a deal that is much less ambitious than ridding the world of Mr Kim’s nukes: ensuring that they are not used.